In the past four or five years, ESPN has become a, flat-out, frontrunner. They seemingly gave up on covering every sport and only covered the ones they care about. I understand that it is good business, but don’t say you’re the world wide leader in sports when you’re really the world wide leader in football, basketball and NASCAR. The only reason NASCAR is worth watching. That is where my beef truly begins. NASCAR is not a sport, it never was a sport and will never be a sport. It is drab, uniform and just plain hickish. The only good thing to come out of NASCAR is Talledega Nights and crashes. I understand that the drivers are very skilled – I know I probably wouldn’t do too well driving 160 in traffic – but, they aren’t athletes. The cars do just as much work as they do. Not only has Johnson not done anything athletic, he has won the last four Sprint Cups because of strategy, not winning a whole bunch of races. Every sport forces it’s champion to win it all, not win sometimes and finish high enough the rest of the time. NASCAR is a complete and utter joke. So, when ESPN lists Jimmie Johnson as a nominee for Male Athlete of the Year, I know they no longer have an unbiased view of sports. Their nominees for the top ESPY are: Kobe Bryant, LeBron James, Albert Pujols, Drew Brees and Johsnon. I have said my piece on Johnson but, I have to ask, why is LeBron James on this list? Yes, he won the MVP, but he didn’t do anything else. Regular season results, particularly in the NBA and NHL are rather meaningless. The season is so long that the only time anything counts is in the playoffs. And LeBron, just like all of his Cleveland predecessors, can’t perform when it matters. Also, when the network is scraping for a stat that reads “the only NBA player with at least 650 assists, 550 rebounds, 125 steals and 75 blocked shots,” you know they don’t have a proper argument for you. That is just one of those stats that gets throw together, sort of like the baseball stat that says a pitcher has thrown 300-straight strikes in the 4th inning of Tuesday games when he has one out. So, I would certainly keep Brees and Bryant on my list. Pujols is a monster, he is just stuck on a middle-of-the-road squad, but he is a serious performer. Why not branch out of your comfort zone and find someone else? You mean to tell me Rafael Nadal isn’t deserving of a nomination? C’mon, that is embarrassing – knee injury or not, he has become the most dominant figure in tennis. Anthony Johnson had an unreal second half to carry Montana to the NCAA Tourney. But does he deserve an ESPY? What’s worse is that is only one category. The “Best Championship Performance” has Anthony Johnson as a nominee. Never heard of him? Me either. Apparently, he blew up at the Big Sky Conference Championship. I won’t discredit his performance (scored the last 21 points to send Montana to the Tourney) but, I’m pretty sure there are a few more names out there they could have found. I don’t know, maybe Kobe Bryant who took over the last two games of the NBA Finals? I don’t even like basketball and I know he should be on this list. The rest of the awards are narrow enough in field of vision that they aren’t too asinine. Although, having a best driver category is so embarrassing. Didn’t the whole NASCAR and poker craze end three years ago? 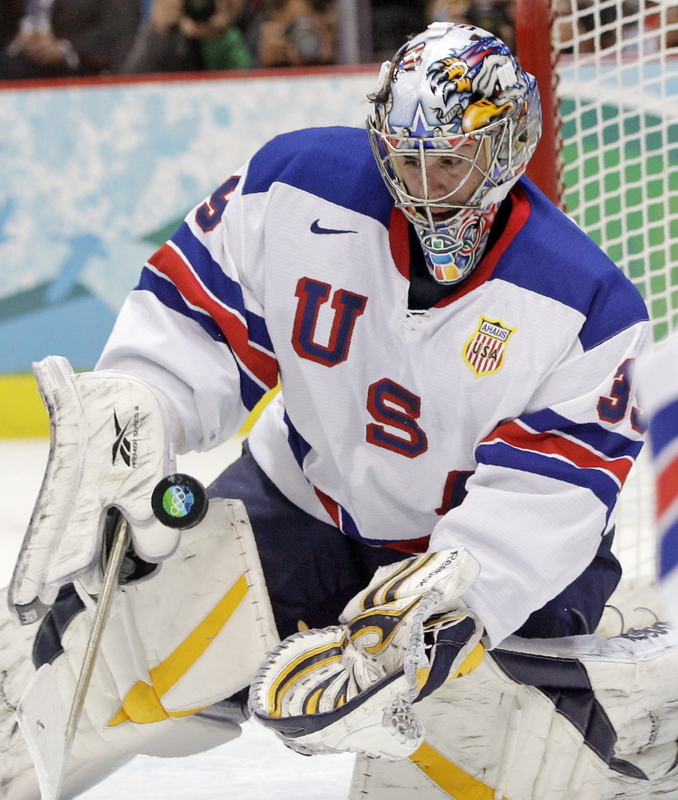 Call me crazy, but wouldn’t most ESPN viewers see Ryan Miller as the Best US Olympic athlete? Lastly, how did Ryan Miller get left off the “Best US Olympic Athlete” nomination? I see merit in each of the nominees. But, Miller may have done just as much for hockey (in the US) at the Vancouver Olympics as all three Winter Classics, Sidney Crosby and Alex Ovechkin combined. Not to mention, he won Tournament MVP and Most Outstanding Goaltender. I think he deserved a spot on the list, if not the right to bump Anton Apolo Ohno off it. Ohno became the most decorated US Winter Olympic Athlete, but he did it in such underwhelming fashion (one silver and two bronze) that I don’t know how big of a deal it really was. No offense to any super speed skating fans out there. Either way, ESPN has become less sports and more entertainment. They don’t care about objective coverage, the ESPY nominations are just a small microcosm of this attitude. Maybe next year Justin Timberlake can win the newest award: “Best Sidekick to an Athlete on TV Commercials”. Next Article Who the hell is going to wear #44 for the Sabres? This was actually a very interesting read. I agree that ESPN does a lot of things for business and that is business. I think a big reason for the no hockey stuff is because stupid NHL commissioner Gary Bettman got a little more money from the Versus network rather than ESPN (BAD BUSINESS) and now ESPN does not give hockey any exposure. Even though I have no love for Nascar and have never watched in my life I’m not sure i agree with you about not calling it a sport. A sport takes physical and athletic ability and you cannot be a top flight driver without those qualities. Things like Poker and Chess aren’t sports but I do think Nascar is. The car’s always make a big difference but with regards to strategy is that you have strategy in every sport and sometimes teams with the best one win. Again great post, I’m going to stick your website in my blogroll on my site.